Seven Springs Ranch encompasses 46 acres of a splendid combination of meadows, forest, springs, streams, and a large pond. From here you can easily walk to national forest land and hike as far as you want to go. There is a variety of wildlife that frequents Seven Springs including deer, black bear, moose, mountain lions, and all sorts of birds of prey. This is a ranch in name only. There are no other rental units located on the property. The guest house was completed in 2002 and it is virtually new including appliances. It is located on a knoll with forest on two sides and meadows on the other sides. This configuration provides an excellent combination of a forest canopy and open views. Our location provides a remote setting with easy access to many lakes including Flathead Lake, Glacier National Park, The Bob Marshall Wilderness, and eclectic tourist centers of Big Fork and Whitefish. We bought Seven Springs Ranch in 1991 as a place we would one day retire to. We needed to rent the main house out while we continued to work, but we quickly came to realize we needed a place to stay when we came up on vacations. So we built the Guest House. It took longer than we thought and by the time it was completed in 2002, we were ready to move up here. It was never occupied except as a vacation rental. Our guests are almost always impressed by the quality of construction. The proximity to Glacier National Park, excellent fishing, boating on a variety of lakes, and hiking. The remoteness of the location and uncrowded ability to get out and enjoy nature. Wildlife viewing and quiet sounds of nature are major attractions. There is also a large pond and a fire pit for camp fires. Rented for about one week mid-September. Simple access to property. Relatively close to Kila and Kalispell. Some hiking trails on property, and all easy to access. Nice pond on property with wood available for campfire. Deer spotted pretty much daily. Two wolves as well. Nicely furnished with what is needed. One bathroom on ground floor. Bedroom in loft accessible using spiral staircase. We used first floor bedroom. Decently clean. Good sleep quality. Quiet, with minor road noise that diminishes in the evening. Views are of surrounding forest. Furnishings are good, but not modern. WiFi works well. Did not use TV. Phone service decent, and there is a landline. Garage is narrow and they use it for things, so cannot park car inside. All appliances work properly. About an hour or so to Glacier NP. Owners are friendly and helpful, and live adjacent to rental. Good stay. Very clean and easy to live in. The kitchen had everything we needed to cook and enjoy. Bed linens were crisp and comfortable. Being 20 minutes from a grocery store and downtown was a huge plus. We’ll gladly stay again when we’re in town. What a great place in the woods! My girlfriend and I stayed here for a week while visiting my family and friends and attending a wedding. This place is great! You are secluded in the house and you can not see any other building, just the forest, which is exactly what we wanted. The house is spotless, well put together and they provide all the things you would need for the stay there. The only thing I would recommend is putting curtains over the bedroom window to help block the outside light in the morning. Overall, this place was exactly what we had hoped for and even more. The house is beautiful! The property is well maintained and the owners are very nice! I can't say enough good things about this property, and thank you for such a great time at your house! Vacationing anywhere, often enough, requires another vacation from your vacation. A vacation in which 'rest' is involved. Our vacation in northwest Montana was filled with the daily hustle of going there and getting over here, hopefully in front of the crowds where Glacier National Park is concerned. Thankfully...our nightly destination wasn't a condo, a time share, or a cheap hotel with a pool...it was a cabin tucked into the woods. A place of privacy where we could unwind, relax, and get some 'rest' as we planned for the next day. Excellent cabin. 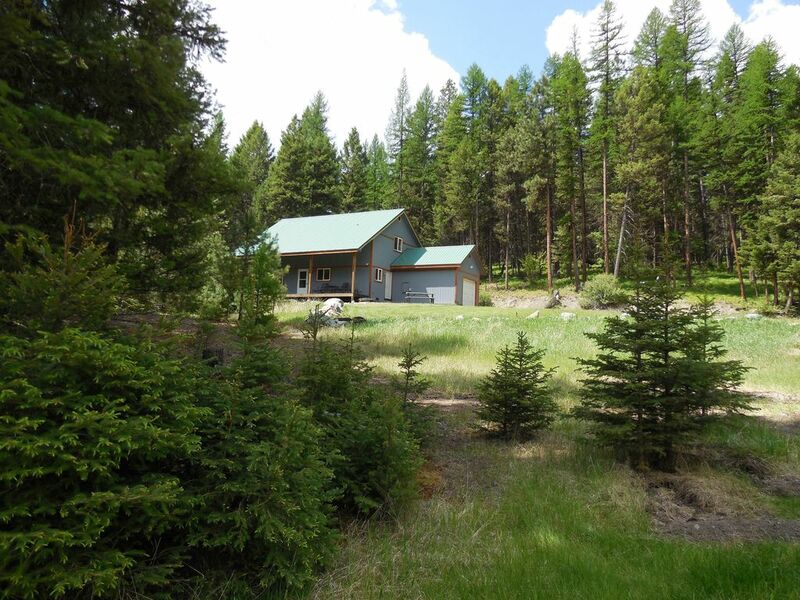 Perfect for relaxation and enjoying the beauty of Montana all around the cabin. Our family thoroughly enjoyed our stay. Beautiful, remote location. House had everything we needed. We loved this home. Such a peaceful retreat away from everything. The house is equipped with everything you might need. It is a 20 minute drive from Kalispell, however the drive is beautiful. We used this as our base to explore Glacier National Park, Whitefish and Bigfork.